Cognitive scientists should be explorers of the mind, forging a path through the chaotic world of everyday life before even thinking of retreating to the lab, according to a critical article in the latest edition of the British Journal of Psychology. Cognitive science often works like this: researchers notice something interesting in the world, they create a lab-based experiment in an attempt to control everything except what they think is the core mental process, they then test the data to see if it predicts real-world performance. A new approach, proposed by psychologist Alan Kingstone and colleagues, suggests this is fundamentally wrong-headed and we need to completely rethink how we study the human mind to make it relevant to the real world. The authors suggest that the standard approach relies on a flawed assumption – that mental processes are like off-the-shelf tools that do the same job, but are just assembled by the mind in different ways depending on the situation. But imagine if this isn’t the case and mental processes are, in fact, much more fluid and adapt to fit the environment and situation. Not only would we have to change our psychological theories, we would have to change how we study the mind itself because the assumption that we can isolate and test the same mental process in different environments justifies the whole tradition of lab-based research. The authors suggest an alternative they call ‘cognitive ethology’ and it focuses the efforts of cognitive scientists on a different part of the research process. Let’s just revisit our potted example of what most cognitive scientists do: they notice something in the world, they create a lab-based experiment, they test to see if it predicts real-world performance. The first part of this process (noticing -> lab-experiment) is often based on subjective judgements and rough descriptions and isn’t validated until the lab-based experiment is tested. Kingston and his colleagues argue that scientists should be applying the techniques of science to the first stage – measuring and describing behaviour as it happens in the real world – and only then taking to the lab to see what happens when conditions change. A Nature publication by Land and Lee (1994) provides a good illustration of a research approach that is grounded in the principle of first examining performance as it naturally occurs. These investigators were interested in understanding where people look when they are steering a car around a corner. This simple issue had obvious implications for human attention and action, as well as for matters as diverse as human performance modelling, vehicle engineering, and road design. To study this issue, Land and Lee monitored eye, head, steering wheel position, and car speed, as drivers navigated a particularly tortuous section of road. Their study revealed the new and important finding that drivers rely on a ‚Äòtangent point‚Äô on the inside of each curve, seeking out this point 1‚Äì2 seconds before each bend and returning to it reliably. Later, other researchers used a lab-based driving simulator study to systematically alter how much of this ‘tangent point’ was available to see what caused abnormal driving. The authors also make the point that this approach is much better at helping us understand why something happens the way it does, because it ties it to the real world and helps us integrate it with the our knowledge of personal meaning. It’s an interesting approach and meshes nicely with a recent article on cultural cognitive neuroscience in Nature Reviews Neuroscience. It looked at a number of fascinating studies on cultural influences on mind and brain function and discusses how we can go about understanding the interaction between culture and the brain. If you want to skip the theoretical parts, Box 1 is worth looking at just for a brief summary of some intriguing cultural differences in the way we think. The piece was also rather expertly covered by Neuroanthropology who cover the main punchlines and discuss some of the claims. Link to ‘cognitive ethology’ article. Link to PubMed entry for ‘cognitive ethology’ article. Link to ‘cultural neuroscience’ article. Link to PubMed entry for ‘cultural neuroscience’ article. Computers cause abnormal brain growth – proof! I have discovered shocking evidence that computers are affecting the brain. After extensive research, I have discovered the problem is remarkably specific and I have isolated it to an individual brain area affected by one particular application. Microsoft Word is causing abnormal growth in the frontal lobes. The cingulate cortex is a part of the frontal lobe that is known to be involved with conflict monitoring, pain and emotion, while Microsoft Word is a clumsy but ubiquitous word processing package that has an annoying habit of auto-correcting things you don’t want to be auto-corrected. For example, try typing the words ‘cingulate cortex’ into Word and see what happens. It changes it to ‘cingulated cortex’, adding an annoying ‘d’ onto the end of the first word. Whenever I’m writing a neuropsychology article, I now have the habit of doing a search and replace before I finish to sweep up any of these auto-errors. So I was wondering whether anyone else had suffered the same problem and searched the scientific literature. Now, it could be that people have just been making standard typos throughout history, as adding a rogue ‘d’ is not uncommon, even when we’re writing with a pen, but this doesn’t seem to be the case. While the use of the term ‘cingulate cortex’ stretches back to at least the beginning of the 20th century, the term ‘cingulated cortex’ barely appears, until Microsoft Word’s autocorrection tool arrives on the scene. There are 15 uses of the phrase “cingulated cortex” from 1900 to 2000. There are 1,740 uses from 2000 to now. Microsoft Word, it seems, is slowly changing the brain. 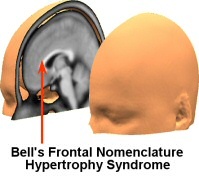 Without further ado, I have named the disorder Bell’s Frontal Nomenclature Hypertrophy Syndrome and demand that it be included in the diagnostic manuals. Thousands of disturbed people will not get the help they need without this essential recognition, although in the mean time I will be offering private treatment at special rates. Of course, I strongly encourage further research and welcome offers of interviews from the press, radio or television. I am also available for weddings, funerals and Bar Mitzvahs. Author vaughanbellPosted on August 29, 2008 Categories Nonsense8 Comments on Computers cause abnormal brain growth – proof! The September issue of The Psychologist has two excellent and freely available articles that smash the popular myths of scientific psychology. The first examines the widely mythologised story of hole-in-the head celebrity Phineas Gage, and the other tackles commonly repeated stories of famous studies that don’t stand up to scrutiny. Gage, whose skull is pictured on the front cover, is legendary, but, as the article makes clear, there’s actually a great deal we don’t know about his life and the information that typically accompanies his story is based on only a very few sources. The article on other myths in psychology focuses on some of the most widely incidents and studies in the field: the murder of Kitty Genovese, Asch’s conformity experiments, Little Albert and the Hawthorne Effect. Other sciences certainly do have their own myths ‚Äì just think of the story of Newton and the falling apple or Archimedes leaping out of the bath following his Eureka insight. Perhaps myths just seem more prominent in psychology because we tend to talk and write about our science in terms of studies rather than facts. Certainly the work of Mary Smyth at Lancaster University would appear to be consistent with this view ‚Äì she has compared psychology and biology textbooks and found that psychology appears to have comparatively few taken-for-granted facts. Instead, numerous experiments are described in detail, lending scientific credence to any factual claims being made. Link to article ‘Phineas Gage ‚Äì Unravelling the myth’. Link to article ‘Foundations of sand?’. Full disclosure: I’m an unpaid associate editor for The Psychologist. Choreography and Cognition is a project examining the cognitive science of dance. Try this for some experimental data. Get down. The myth of undecided voters is tackled head on by Frontal Cortex. Gin, Television and Cognitive Surplus. No, not a traditional English weekend, an Edge article by Clay Shirky on the internet and mental aggregators. PsychCentral’s Sandra lists her Top 10 online psychology experiments. ABC Radio National’s Life Matters explores out relationship to colour. Corpus Callosum has an interesting role reversal art project where a psychiatrist has painted his emotional impression of patients. Epigenetics or the ‘Ghost in Your Genes’ is a new TV programme and is linked to and discussed by Neuroanthropology. The Smart Set review a book on loneliness. The Guardian’s examination of the supposedly mandatory but widely ignored drug company gift registers for UK doctors, shows (can we guess) widespread soul selling. Be sure to check ABC Radio National’s All in the Mind blog for extended comments and extra audio from the recent programme on the mind, markets and morality. Wired Sciece on why early stone tools suggest Neanderthals were equally as intelligent as early humans, contrary to popular belief. Researchers now exploring lack of style, poor personal hygiene as reason for extinction. The rubber hand illusion is accompanied by a drop in temperature of the ‘displaced’ hand. Another from Wired Science. The BPS Research Digest reports a interesting study that finds we tend to overestimate the size of our own heads, but not those of others. The three critical techniques for stage magic discussed in the recent paper on the cognitive science of magic are summarised by PsyBlog. Harvard Magazine has an article on ‘A Work in Progress: The Teen Brain‘. Due to be completed shortly after Duke Nukem Forever. July’s Neuropod appeared and we didn’t even notice. Still, the programme has been eerily quiet since then. Why Are ‘Mama’ and ‘Dada’ a Baby’s First Words? Sounds obvious but it’s actually an interesting study into developmental phonetics. BBC News reports that the drug rasagiline may may actually slow down Parkinson’s disease according to an early study. Cool photo on Flickr appropriately called ‘applied radiology‘. Cannabis use went down in the UK after it was reclassified as a ‘softer’ drug, reports of The Guardian. Buckets of urine at the ready to be flung into the wind when government shortly re-reclassifies it as a ‘harder’ drug. Interesting experimental philosophy paper makes it into the top 10 philosophy papers of the year. Furious Seasons catches two interesting antipsychotic news nuggets: Nature Neuroscience editorial says credibility lacking in child psychiatry after recent payments scandal / BMJ reports antipsychotics really, really bad in older folks. Wikipedia has a short but fascinating page listing animals by the number of neurons they have. There’s only about a dozen entries on there, but most interesting is that there is an animal with no nerve cells at all. It’s called Trichoplax and apparently is a “a simple balloon-like marine animal with a body cavity filled with pressurized fluid”. Apparently humans don’t come top of the pile, as both elephants and whales have more neurons. However, it’s not the best referenced article in the world, to say the least, so I’m taking this last claim with a pinch of salt for the time being. If you know better, do update the article with some more reliable sources. Link to ‘List of animals by number of neurons’. Neurophilosophy has a stimulating article on Wilder Penfield, the legendary Canadian neurosurgeon who pionered neuropsychological studies on the awake patient during brain surgery. Penfield is most famous for his experiments where he electrically stimulated the brain of patients who had part of their skull removed during surgery to record what thoughts, behaviours and sensations arose from the excitation of specific parts of the cortex. This research is still being done in modern times. My favourite is a 1991 study on electrical stimulation of the supplementary motor area SMA) by (no laughing now) Fried and colleagues. hand” to very specific movement intentions such as the “urge to move right thumb and index finger”. The gripping and typically well-researched Neurophilosophy article takes us right into the middle of one of these experiments performed by Penfield, and goes on to explain how his work became so influential in science and medicine. Penfield was a pupil of Harvey Cushing, considered the founder of scientific neurosurgery, who was featured only last week on the same excellent blog. Unlike Cushing though, who was reknowned for being a bit spiky, Penfield was widely considered to be a warm and friendly individual. It’s probably the best article on Penfield you’re likely to find on the net, so well worth taking the opportunity of learning more about this key figure in our understanding of the brain. Link to article ‘Wilder Penfield, Neural Cartographer’. Link to previous Mind Hacks post on Wilder’s operation on his sister. Today’s New York Times has an interesting article on the tug-of-war over the cultural influence on paranoid delusions and whether contemporary-themed psychosis is a new form of mental illness or just a modern colouring of an old disorder. The article focuses on the recent interest in the ‘Truman Show delusion’, splashed over the media by two Canadian psychiatrists. It’s quite hard to judge what they’re aiming to do as they’ve not published a scientific paper, and the article suggests they’re writing a book (is that the sounds of alarm bells I hear? ), so I’m solely going on secondary sources. But if they’re saying that delusions specifically about being in the Truman Show are somehow new and interesting, then they’re right in a way. Popular culture often turns up in paranoid beliefs – I worked with a gentleman once who believed he was in The Matrix – but its not earth shattering. It happens all the time. If they’re saying that the general experience of The Truman Show – feeling that the world is being controlled, is unexplainably altered, or is uncannily mysterious – is somehow new, then they’re wrong by a good 100 years. This was described by the German psychiatrist Karl Jaspers in the early part of the 20th century who called it Wahnstimmung, which is translated in the modern English literature as delusional mood or delusional atmosphere. ‚ÄúCultural influences don‚Äôt tell us anything fundamental about delusion,‚Äù said Vaughan Bell, a psychologist at the Institute of Psychiatry at King‚Äôs College in London, who has studied Internet delusion. ‚ÄúWe can look at the influence of television, computer games, rock ‚Äôn‚Äô roll, but these things don‚Äôt tell us about new forms of being mentally ill,‚Äù said Dr. Bell, who said he had also treated patients who believed they were part of a reality television show. Actually, I do think that cultural influences are fundamental in understanding delusions, but not in themselves. [Squiggly sound of tape rewinding] It seems the crucial qualification “in themselves” was missed off the quote. To quote John Donne, “no man is an island” and we can only fully understand or thoughts and behaviour, either everyday or pathological, with reference to the cultures we live in. But this doesn’t mean that each aspect of cultural influences us equally on all levels. Link to NYT article ‘Look Closely, Doctor: See the Camera?’.